THE GULF between principle and practice is often fatal for policies—and for political careers. Britain’s government faces a backlash over universal credit, a reform combining six welfare programmes into one. This was widely seen as a good idea about a decade ago. But a series of administrative failures, a senseless decision to make payments well in arrears and a squeeze on the system’s overall generosity have left many claimants angry. Some are destitute. In places where universal credit replaces legacy benefits, reliance on food handouts rises and more people fall behind with the rent. This good-idea-turned-disaster has already led the government to delay the reform. Some critics say it should be abandoned altogether (see article). They are wrong. If the government corrects its mistakes—starting by providing a little more money in its budget on October 29th—universal credit could still succeed. In fact, Britain might end up with a world-class welfare system that approximates an idea long advocated by many reformers, including this newspaper: a negative income tax for low earners. Welfare systems worldwide are plagued by complexity. By one count America has 72 federal anti-poverty programmes providing cash or benefits. France has upwards of 35 state-pension schemes. In Japan welfare recipients must sell items that are deemed—sometimes at the whim of an individual bureaucrat—to be luxuries. Complexity creates obstacles that prevent the hard-up claiming support that is meant for them. It also leads to haphazard patterns of eligibility and, as a result, poverty traps in which it is more lucrative to earn less in wages. Universal credit is designed to fix both problems. After it is fully implemented, it will cover seven of every ten pounds in the working-age welfare budget. Official forecasts say that as take-up rises another £2.9bn ($3.7bn), or 5% of the programme’s total cost, will be handed out. It will always pay at least a little for recipients to earn more. Welfare states also have an undesirable tendency to spend ever more on increasingly wealthy and numerous pensioners, leaving an ever skimpier safety-net for those of working age. 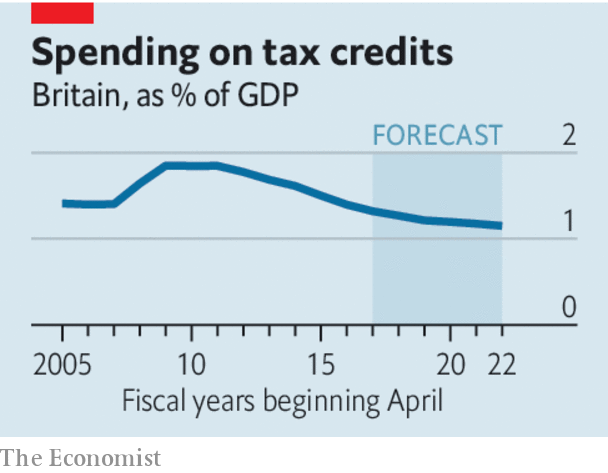 Britain has recently followed this trend, boosting state pensions by 6% (after adjusting for inflation) since 2010 even as working-age welfare has been cut. Worse, the government has used the launch of universal credit as cover to deepen the cuts. Nonetheless, among rich countries Britain’s welfare system is one of the more progressive. The last time it was counted, 34% of British welfare spending went to the poorest fifth of the working-age population, compared with an OECD average of 23%. The EU as a whole shells out about 9% of GDP on state pensions; Britain spends only 5%. And even after recent cuts, in 2018 it will still spend more than three times as much as America, as a share of GDP, on wage top-ups for poor workers and parents. Targeted spending has a cost. Focusing money on the poor means withdrawing it fairly rapidly as people earn more. Universal credit’s withdrawal rate is 63%, meaning claimants lose 63p for every £1 they earn above an allowance. The disincentive to work can be sharper still once payroll and other taxes are taken into account. Amazingly, this is an improvement on the previous system for most claimants. But it is a steeper taper than reformers proposed when they first dreamed up universal credit. Such a trade-off between generosity and work incentives is inherent in negative income taxes. Proponents often envisage a withdrawal rate comparable to the basic rate of tax. Without a much larger contribution from most workers that is incompatible with a safety-net of today’s strength. Luckily, low earners seem less responsive to high tax rates than other groups, perhaps because they have more need of extra cash. Still, the disincentive to work is too strong. Blunting it would be worth the money. Make no mistake: universal credit has so far done more harm than good. But it is a policy worth rescuing—and not just because doing so is good politics. Rather than being a national embarrassment, Britain’s welfare reform could eventually become a shining example for others.